A recent study of the giant storm whirling on Saturn for the past two years, which became known as the "Great Springtime Storm", has given planetary scientists new clues about the planet's weather. Using a combination of data from the Cassini orbiter and ground-based telescopes, the scientists traced the storm's development from deep within the churning clouds in Saturn's lower atmosphere to altitudes hundreds of kilometres above the cloud decks, in the planet's stratosphere. There, two large pockets of warm air formed and later merged into one gigantic hot vortex that has been travelling around Saturn's northern hemisphere since mid-2011. The study of this storm and its associated vortex, which occurred unusually early in Saturn's 30-year-long weather cycle, suggests that waves play an important role in the energy transfer across the planet's atmosphere. Click here for more information on this video. Storms are large disturbances in a planetary atmosphere. A common phenomenon on Earth, storms are not unique to our planet's weather and may arise on any planet that is surrounded by a thick atmosphere. Astronomical records report similar events on several planets in the Solar System, and recent data hint at possible storms on exoplanets. A new study, based on data from the NASA/ESA/ASI Cassini-Huygens mission and ground-based telescopes, has looked into one of the largest storms recorded in the Solar System, which started whirling over Saturn's mid-northern latitudes about two years ago. The storm originated in the planet's lower atmosphere, where it was first seen in December 2010, and later grew to encircle the entire planet. The disturbance also propagated to higher atmospheric layers, where its aftermath can still be detected. It is known as the 'Great Springtime Storm' because it took place during the spring season in the planet's northern hemisphere, which started in August 2009 and lasts about seven years. "Giant storms on Saturn occur regularly and have been observed for over a century, but this is the first time we could follow the temporal evolution of such an event in great detail," notes Leigh Fletcher from the University of Oxford, UK. Fletcher has led an extensive study of the Great Springtime Storm using data gathered in the infrared portion of the electromagnetic spectrum by the Cassini spacecraft, which has been orbiting Saturn since 2004, as well as ESO's Very Large Telescope and NASA's Infrared Telescope Facility. "The storm was first detected in the planet's lower atmosphere – the troposphere – via optical and radio observations. Then we looked for its signature at mid-infrared wavelengths," explains Fletcher. VLT image of Saturn's giant vortex at mid-infrared wavelengths. "When we look at Saturn's atmosphere in optical wavelengths, we see the sunlight that is reflected by a haze layer located deep down in the troposphere. In the mid-infrared, instead, we directly measure the temperature of the atmosphere for many kilometres above the clouds. This allows us to peer through the three-dimensional structure of the atmosphere," he adds. Observing at these longer wavelengths provided a drastically different view, and allowed Fletcher and his collaborators to probe how the storm had infiltrated the upper part of the atmosphere – the stratosphere upwards from the troposphere. The presence of Cassini in the saturnian system and its ability to perform mid-infrared observations has allowed the astronomers to monitor the evolution of this unique meteorological event in unprecedented detail. Mid-infrared images from January 2011 showed that two large pockets of warm air had formed over the storm, in the stratosphere. These warm air masses, also referred to as 'beacons', were both moving westwards, although with different speeds, and remained clearly separated for a few months. Between April and June 2011, the two beacons merged and gave rise to a giant vortex of clockwise-swirling air – an anti-cyclone – with temperatures up to 221 K, hotter than the surrounding air by 70-80 K.
The huge anti-cyclone in Saturn's stratosphere had fully detached from the tropospheric disturbance that caused it in the first place. At its biggest, in late June 2011, the vortex covered about 62 000 km – almost one quarter of the planet's circumference at the mid-northern latitudes affected by the storm. At the same time, the storm in the troposphere, only visible at optical wavelengths, had almost ceased. Saturn's 'Great Springtime Storm' in visible light. "We kept monitoring Saturn during the storm with the help of many small, ground-based telescopes operated by professional and amateur astronomers alike, and found no sign of the giant vortex in the optical data. Although the tropospheric storm was the underlying cause of this enormous vortex, the vortex subsequently evolved independently of events happening deeper down, and was still present long after the tropospheric storm was over," he adds. Since July 2011, the giant hot vortex has been shrinking and cooling at a very slow pace. It is still present in Saturn's stratosphere, where it has shrunk to less than half of its greatest extent, and is expected to disappear completely in a couple of years. The data analysed by Fletcher and his collaborators showed how the temperature, wind velocity and chemical composition varied within and around the giant vortex. This allowed them to unveil how the storm had evolved over several months, and to investigate the energy transfer mechanisms at play among the various layers of Saturn's atmosphere. "We suspected that the weather in the lower atmosphere has an impact on what happens at much higher layers, hundreds of kilometres upwards, just as happens in Earth's atmosphere. 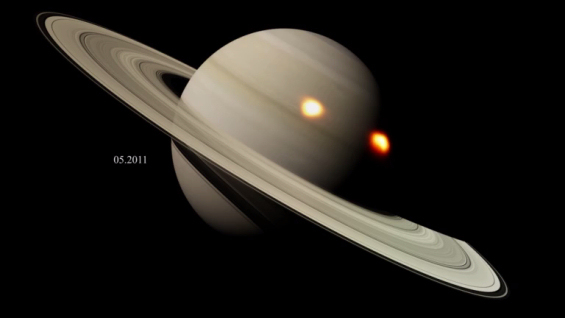 Now we have evidence for this on Saturn," says Fletcher. In Earth's atmosphere, storm-generated waves are known to transport air and energy across the atmosphere, including upwards to the stratosphere. It is possible that a similar mechanism has taken place on Saturn, too: wave-like perturbations, induced by the tropospheric storm, might have made their way upwards to the stratosphere, where they released their energy and caused the formation of the two beacons. "What is unusual in this particular case is that the two beacons interacted with one another up in the stratosphere, giving rise to the giant vortex. How exactly this happened remains an open question that needs to be tackled via numerical simulations," comments Fletcher. The timing of the storm is also quite puzzling. Since 1876, large disturbances have been observed on Saturn with striking regularity: once every 'saturnian' year, which lasts about 30 years, and always during the northern hemisphere's summer season. The last such storm on record dates back to 1990, and the next one was expected in 2020. "The Great Springtime Storm is definitely ahead of schedule with respect to Saturn's standard storm cycle. It is still unclear whether this is an isolated event or a signal that the storm season on the planet started earlier than expected," comments Nicolas Altobelli, Cassini-Huygens Project Scientist at ESA. "Cassini will keep monitoring Saturn's atmosphere from its vantage point. The mission will be operating until the northern summer solstice, which will take place in May 2017. The storm season on Saturn's northern hemisphere may not be over yet, and in this case we might be able to see other spectacular events in the next few years," Altobelli adds. "If storms are detected on Saturn in the upcoming future, it will be important to verify whether these will also produce dramatic aftereffects such as the stratospheric vortex from 2011," Fletcher concludes. The study presented here is based on data gathered with the Composite Infrared Spectrometer (CIRS) on board the Cassini orbiter from the NASA/ESA/ASI Cassini-Huygens mission. The data were complemented by ground-based observations from the VLT Imager and Spectrometer for the mid-Infrared (VISIR) on ESO's Very Large Telescope, located in Chile, and from the Mid-Infrared Spectrometer and Imager (MIRSI) on NASA's Infrared Telescope Facility, located at Mauna Kea, Hawaii, USA.